“It’s ok. It’s not your fault”, said the medical paediatrician on the phone to me today. The tears welling up in the back of my eyes dripped down my face as she had no idea just how much I needed to hear those four words: It’s not your fault. I had called her yesterday as over the last five days my precious boy was fast disappearing in front of my eyes. We had went from one extreme to the other of him not sleeping for as long as 19 hours at once to him wanting to sleep pretty much all day and all night. Last week he started a ‘medicine’ (it came from a pharmacy but in actual fact is better described as a supplement) called melatonin and although on the first night of taking it he was still awake at 3am by night three he was not only sleeping through the night but wanting to sleep all day as well! I admit the first full nights sleep in 4 years and 8 months was wonderful but there is something deeply worrying when your active, energetic and demanding 4 year old suddenly has no interest in food or life and won’t even try and get out his buggy. I was so concerned I called the hospital and was so relieved when the paediatrician called me back. It turns out both she and myself had both been busy the last few days. While I had been spending time completing Isaac’s disability living allowance renewal (no less than 42 pages of total negativity of all the things my son can’t do and all the things wrong with him) she had been speaking to lots of people involved with us and trying to secure better services for us. 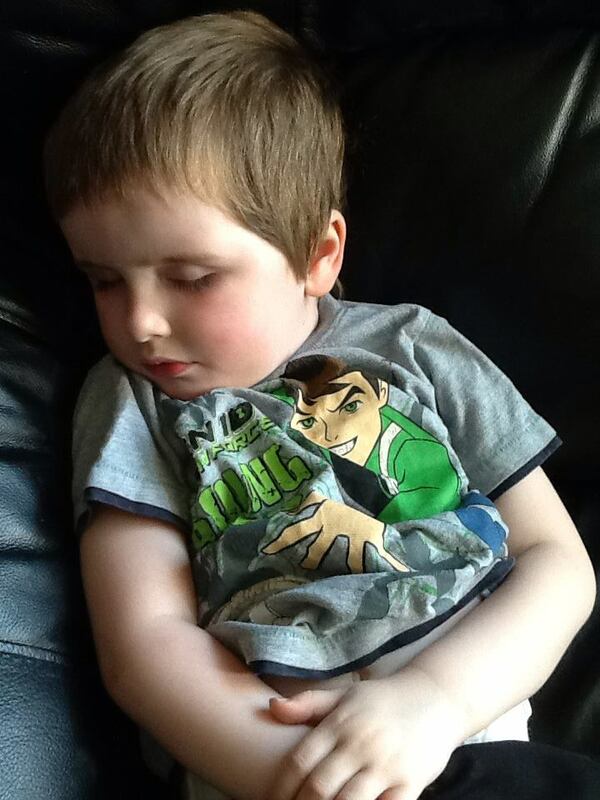 She had only met Isaac once as she had taken on his case from another paediatrician who was unable to see Isaac as often as he required as her caseload was so heavy. But in that short time she got a good picture of how Isaac is and she had already read his medical and case history and had an ear ready to listen. And listen she did. That was what she could hear over Isaac screaming and crying so loudly. She even allowed him to climb onto her table and pull down a calendar from her wall and sit in his buggy scanning the corners and straight lines just so she could listen to us. That was going above and beyond the call of duty already in my eyes. She showed concern and empathy when she heard how little sleep we were all getting so suggested we try melatonin. We had to try something. So here we are having giving our son this so called miracle sleep drug and now we seem to be losing him to a sub conscious state that filled me with guilt and dread. I was even promising myself I would never again complain about his 3am parties, his climbing and sitting at the windowsills, his endless flapping, his screaming and the licking of everything in sight. I just want my boy back! “It’s not your fault” she said. So we will alter the medication. We misjudged how much he needed. The climbing and sitting at the windowsills: It’s not your fault. She had spoken to the social worker who had told us we had to stop him doing it. The one who implied we were being irresponsible. (see my previous blog “I’m sorry I’m failing you my son”) The paed had seen the video and saw how happy he was. She told the social worker that Isaac will never understand the dangers involved and he will crave the feedback and sensory input he gets from sitting there, so social work have to make it safe for him. The fact he is still non verbal: This isn’t your fault! I know you are doing everything you can to help his communication. You have another child who speaks fluently. You are doing nothing wrong. Mrs Gwynne, your son has classic autism. He has a neurological disability. The pathways in his brain do not function properly. None of this is your fault. He is still fully incontinent and this is not your fault. He is severely developmentally delayed but that is no-one’s fault. He may or may not learn this skill in time but do not torture yourself trying to toilet train him. Don’t worry. I have stressed to occupational therapy that the fact you have not received the promised aids is not good enough. I am not at all happy that any family has had to go through this and I fully expect them to get this sorted urgently for you. I understand you are now seeing the specialist occupational therapist regarding your children’s sensory needs. Good. This can only help. Although I am not dealing with your daughter I am aware she has bladder and bowel issues and social and communication difficulties. Can I stress none of this is your fault. She kept stressing It’s not my fault. And the tears kept falling. There is healing in tears. And there is also Godly timing. And talking of Godly timing I was thinking out loud of who would be best to complete the section on Isaac disability form (someone who knows him) having listed no less than 16 professionals who see him on a regular basis, when I hear knocking at the back door and in comes the health visitor. The ‘book’ that is DLA and the reports that are being sent in with it can now all be sent back within 7 days of it being received. Ah, now there’s the silver lining in all this sleepiness that Isaac has had. I would never have had the energy to face such a form never mind complete it so thoroughly on the little sleep we had up until last week. My children both have autism and other issues. But as this wonderful paediatrician reminded me this week this isn’t my fault. Are your children struggling with illness, behaviour, education or personal issues? It isn’t your fault! Did your marriage fail or your house get repossessed? Did you lose your job or get ill? It isn’t your fault! We are human. We do our best. And sometimes things don’t turn out as we want them to. But that isn’t our fault. It is life. Do your best. And let God do the rest. And keep believing for that miracle and Godly timing. And enjoy sleep when you get it! No matter how much you probably know none of this is your fault, it is so necessary to hear it from others. So here I go putting in my two pennies worth. From what I have read I can see your two little ones were so lucky to be born with you as their mum. It is not your fault in any way! Wonderful words ~~ Your new paediatrician is Surely Heaven sent ~~ A Specific Answer to Specific Prayer!! Thank you, Lord! Your children are so lucky to have such a caring mum as you. Thank goodness for a professional who can reassure you this is not your fault. You are loving caring gifted parents and are doing your utmost for your children. Anyone who is unable to see this needs their eyes tested. To the most fantastic caring parents and two beautiful grandchildren it is not your fault. I can’t tell you what it means to be able to read about your day to day life with your kids. I only just started reading your blog and I am working my way back through your entries reading through the slices of your life that you have so honestly shared. We are still learning how to cope with our daughter and how to help her and your blog is such an encouragement. This entry really touched a nerve for me as I feel so guilty in so many ways and so inadequate for her. Thank you for your honesty and the time you take to share your thoughts.